There's a couple of beer dinners this week and an awesome party happening on January 26th. Mark your calendars! Uinta Beer Dinner - Busy Bee will host a 4-course dinner featuring beer from Uinta Brewery in Salt Lake City on Tuesday, Jan. 17th at 7 PM. The cost is $40 per person and you can reserve your spot by calling (919) 424-7817. 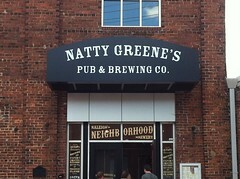 Natty Greene's Winter Beer Dinner- This 5-course meal featuring winter brews from Natty Greene's will happen on Wednesday, January 18th at 6:30 PM. The cost is $40 per person and you can reserve your spot by emailing them. A Night Out in Raleighwood - Raleigh's newest co-working space, The Raleigh Forum and iContact will host an Oscar-themed cocktail party on Thursday, January 26th at 7:30 PM! Mingle with Raleigh's finest and nominate them for awards. Tickets are $15 and include beer and wine provided by The Wine Feed and appetizers provided by Gravy. 50% of the entry fee will be donated to Change the Triangle, a volunteer organization. Purchase tickets here!